They all look amazing! Which look is your favorite? 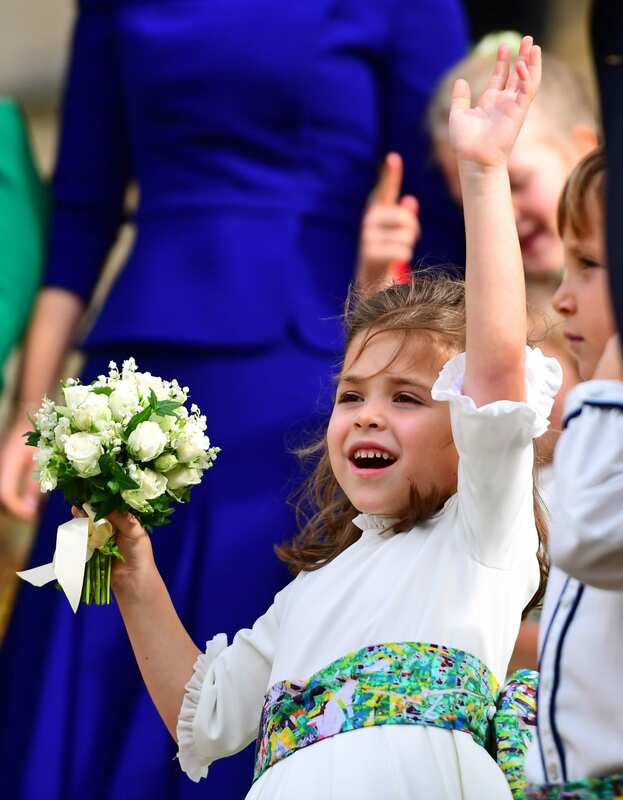 This has been an especially exciting year of royal weddings filled with A-list attendees, wonderful candid moments and, of course, gorgeous fashion. 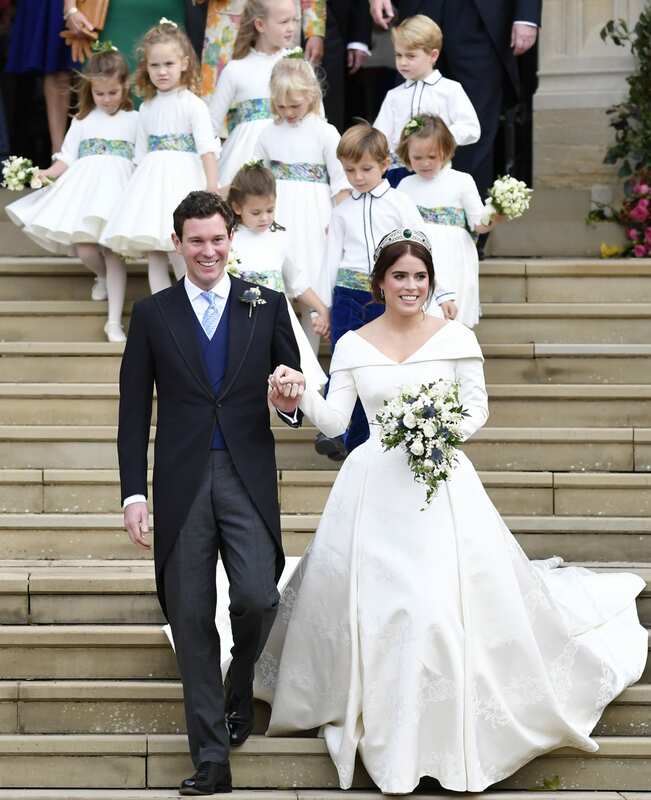 The latest royal wedding, between Princess Eugenie and Jack Brooksbank, was certainly no exception. Eugenie’s dress was designed by the British designers Peter Pilotto and Christopher De Vos. 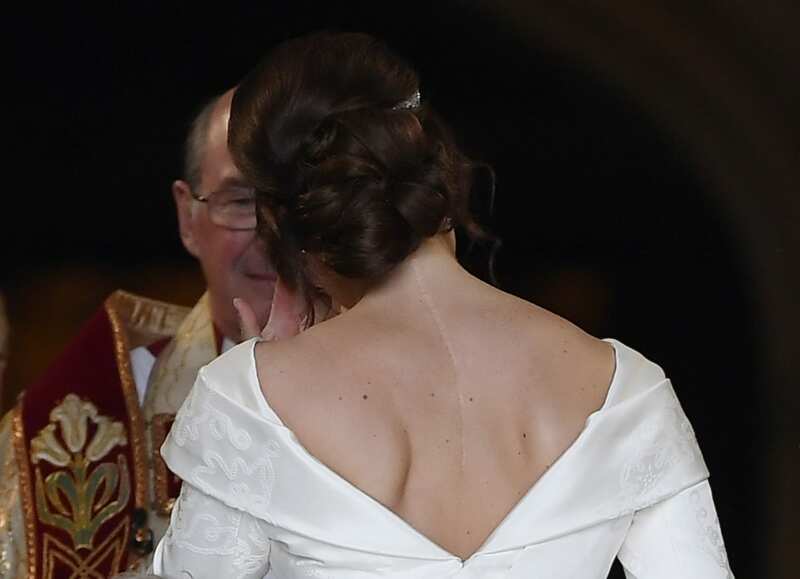 The silk fabric had meaningful symbols woven into it, including ivy to represent the couple’s home in Kensington Palace, Ivy Cottage, and a York Rose to honor her family name of York. The happy groom wore a morning suit. 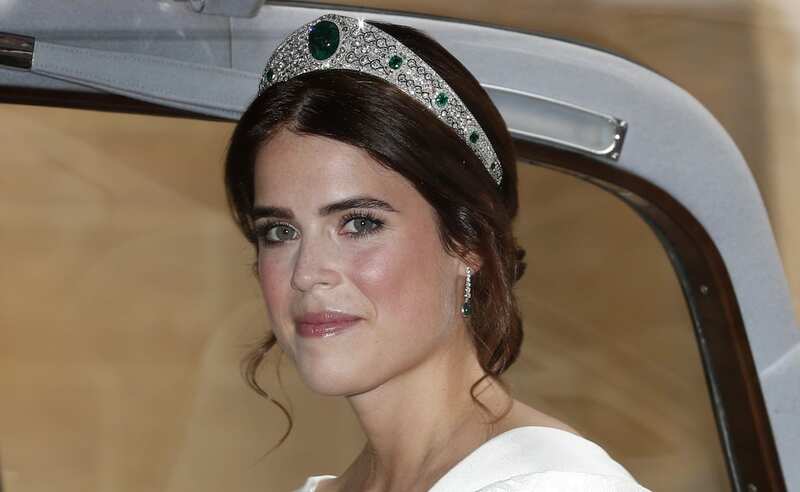 The Queen loaned her granddaughter a stunning diamond and emerald tiara for her wedding day. The green accented Eugenie’s hazel eyes, and matched her bouquet, wedding party colors and gorgeous diamond and emerald drop earrings. Hold onto your hats, literally, because it was a windy wedding day in Windsor, and get ready for stunning snap after stunning snap. 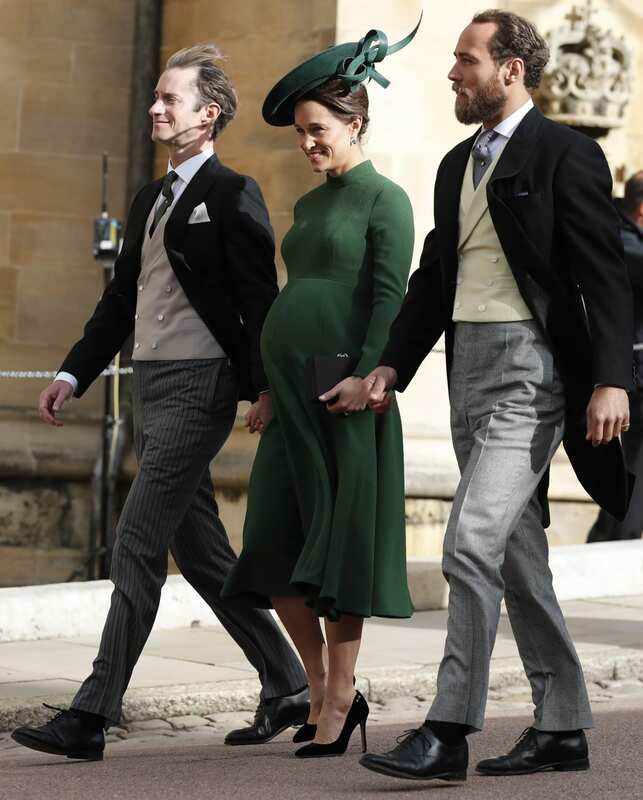 You can see proof of the wind in this gusty, but gorgeous, photo of a trio of well-dressed guests arriving at St. George’s Chapel at Windsor Castle. 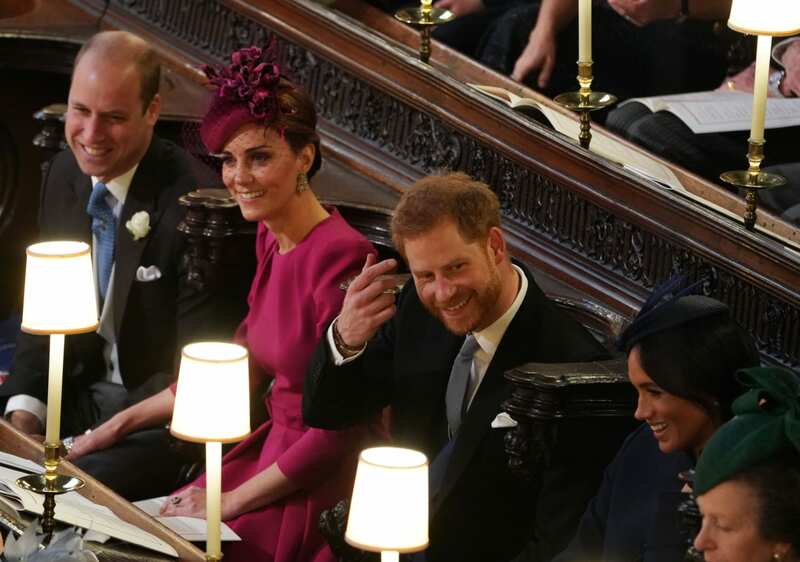 The royal couple looked closer than ever. They held hands during the ceremony and a photographer even caught that touching moment on camera. 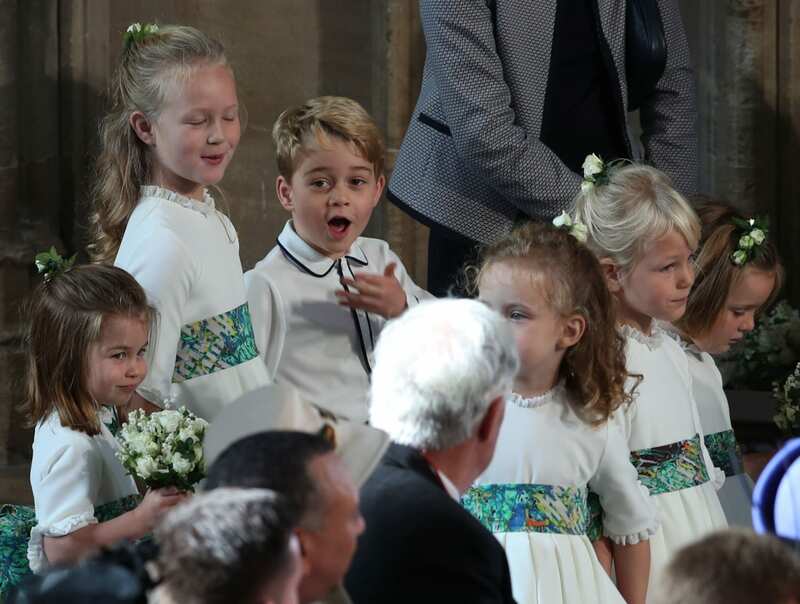 The royal children were among the bridesmaids and page boys at Eugenie’s wedding. 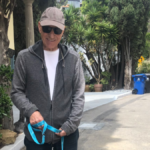 This photo captures what looks like a moment of mischief plotting. 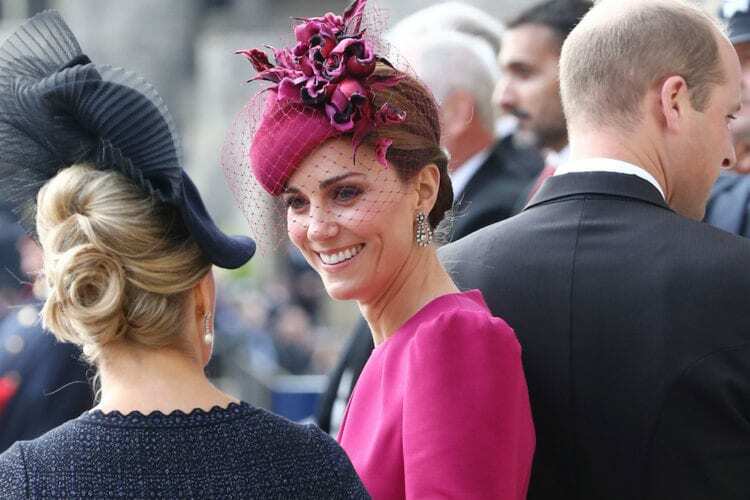 Kate’s sister got us all talking at a royal wedding once again. 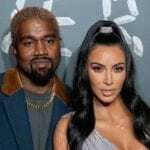 She and her burgeoning baby bump looked stunning in a green, long-sleeve dress. She attended the wedding with her husband, James Matthews. Her Majesty arrived in a surprising baby blue and pink lace dress, a stark departure from her usual bright suits. She paired her pastel ensemble with a tweed coat and top hat. 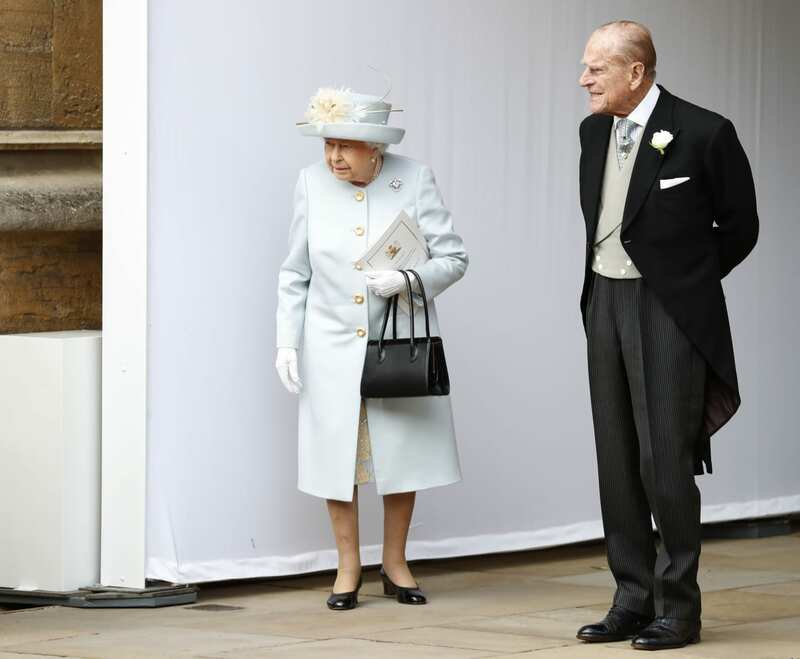 In his morning suit, Prince Philip was by her side throughout the wedding. Princess Beatrice honored her sister in a rich royal blue dress and complementary head band. Mother of the bride Sarah wore a striking teal dress and matching hat. The American actress fit right in with the royals with a head-to-toe burgundy ensemble. Her outfit looked very similar to Kate’s, so she was right on target with her attire. 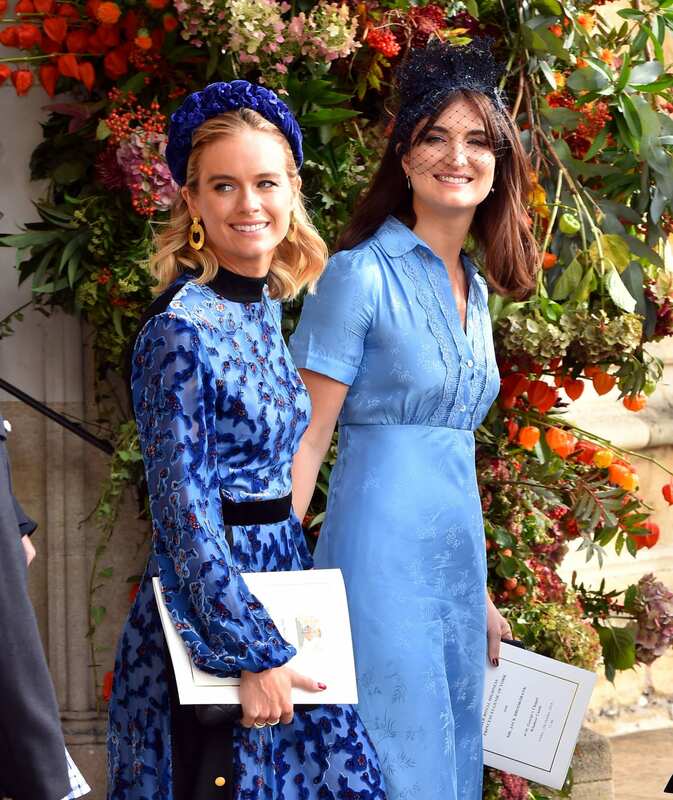 The British model and actress matched her fluttery cutout periwinkle frock with a long coat, but opted for a brighter blue fascinator with an eye-catching plume and black heels. Also a British model and actress like her sister, Cara Delevingne donned a chic menswear look with a fitted, cropped jacket and black trousers. She accessorized with a patterned tie, black stilettos and a top hat. 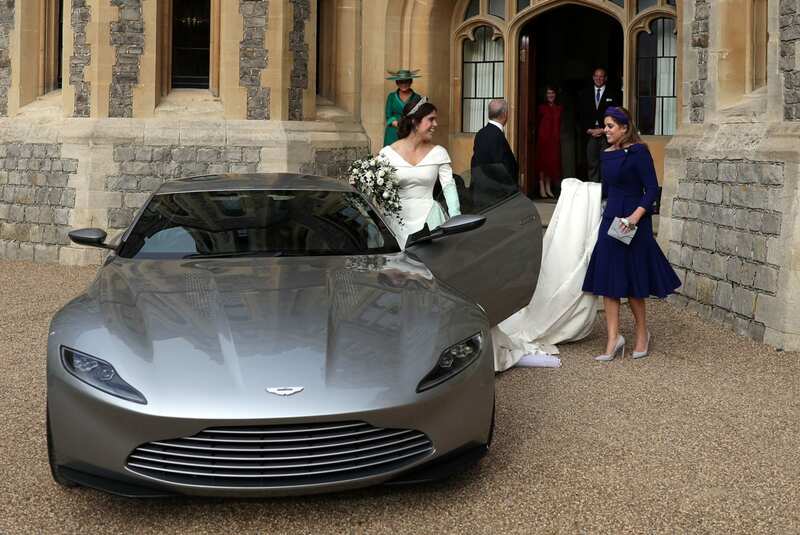 Actress Liv Tyler and her partner, British soccer agent Dave Gardner, arrived in style. Supermodel Kate Moss popped in the crowd thanks to her polka dot set and royal blue stilettos. Moss attended with her daughter, Lila Grace, who looked lovely in a long pale pink lace dress. The British supermodel elevated classic tweed with a sassy fringe accent on her jacket and dress. Singer Ellie Goulding looks stunning in a light blue ensemble with a hint of shimmer. She attended with her art dealer fiance, Caspar Jopling. 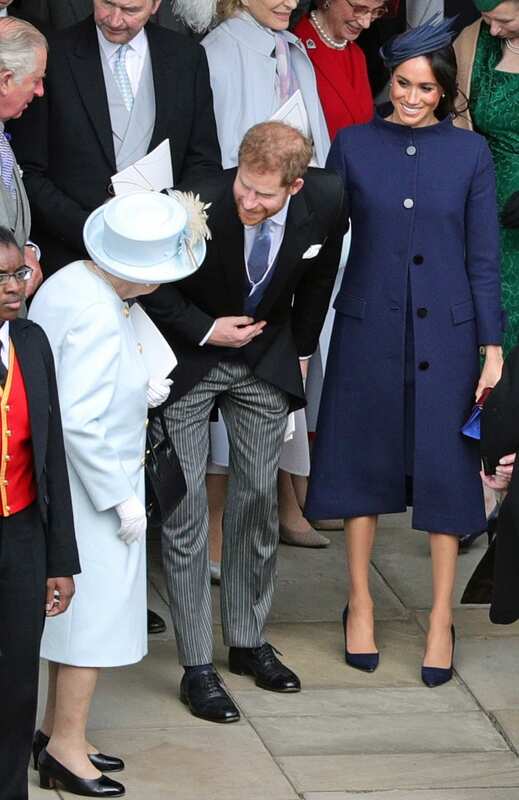 Davy (one of Prince Harry’s ex-girlfriends) held onto your hat in the wind as she showed up looking lovely in a navy blue dress and matching heels. Prince Harry’s other ex-girlfriend, Bonas (left), also wore dark blue. The singer and his wife, Sofia Wellesley, looked smart upon arrival to the wedding. Another British singer/songwriter, Robbie Williams, was in attendance alongside his actress wife and mother-in-law. Daughter, Theodora, was part of the princess’s wedding party. Theodora Williams was part of the bridal party. 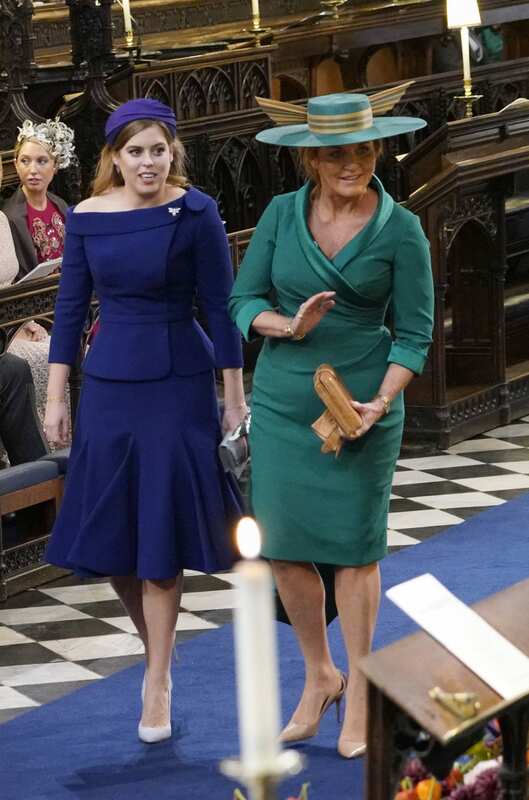 Sarah, Duchess of York, wore a flattering green suit, and was on friendly terms with ex-husband, Prince Andrew, on their daughter’s big day. Princess Beatrice chose a smart blue suit for her maid of honor duties. Here, she helps send her sister off from Windsor Castle to her evening reception. The pop star and his husband, Jwan Yosef, arrived in style to the royal wedding. Kate and Pippa’s younger brother, James, was also in attendance. He arrived alongside Pippa and her husband. What was your favorite look from the guests at the wedding?